The concept of frailty identifies vulnerable people who have an increased risk of adverse health outcomes. Frailty is not defined by a specific chronological age, but it is more common among older people. Some groups within our society, e.g. people of Māori ethnicity, have higher rates of frailty and experience it earlier, often due to multiple co-morbidities. Understanding how frailty impacts upon health, particularly in the context of prescribing and reviewing medicines, can help to minimise harm and improve outcomes for older people in primary care. Polypharmacy is common among people with frailty and is a risk factor for adverse reactions to medicines. Stopping medicines that are no longer appropriate or necessary may reduce this risk. Frailty can be regarded as a “risk” state, where a person with frailty is more likely to have an adverse outcome in response to a health challenge than a person without frailty. Often clinical guidelines will include chronological age in their recommendations, however, in some situations it may be more appropriate to make treatment or intervention decisions based upon the frailty status of the patient, i.e. if the outcome is likely to be affected by this state of increased vulnerability, such as initiating a new medicine or referring for a major surgical procedure. These data highlight the variability in the health needs of older people. It is also important to be aware that many older people do not have frailty and are likely to be more resilient to health challenges than people with frailty, regardless of their chronological age. ** This study defined frailty as having six or more medical, physical or mental health problems, and difficulties carrying out activities of daily living. Frailty is more common among older females than older males; however, males with frailty have an increased risk of all-cause mortality compared to females.5, 6 The underlying reasons for this difference are complex and not fully understood, but predominantly relate to females having a longer lifespan than males. Māori are more likely to have frailty than non-Māori (11.5% versus 7.9% of people aged ≥65 years) and at a younger age, e.g. the prevalence of frailty among Māori aged 65 to 70 years is similar to non-Māori aged 81 to 84 years.5 This likely due to the earlier onset of chronic disease and a higher prevalence of other risk factors, e.g. smoking or obesity, in this group. These factors may also increase the risk of frailty in people of Pacific ethnicity. Grip strength may also be used to assess frailty.1 This can be tested by asking the patient to grip onto your fingers as tightly as they can, and subjectively measure their grip strength, or it can be measured precisely with a hand-held dynamometer. A number of other assessment tools have been developed to facilitate the identification of frailty in a clinical setting.3 These typically involve a questionnaire-based approach, but may also include physical measurements.1, 3 However, the clinical utility of such tools in a primary care setting is limited, often due to the time required to complete the assessments or lack of proper validation. 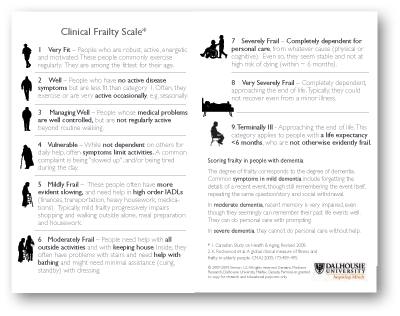 One example of a validated frailty assessment tool which may be useful in primary care is the Clinical Frailty Scale.16 This tool identifies frailty according to a nine-point scale ranging from very fit through to terminally ill, with stages of vulnerability, i.e. frailty, in between. The scale is based on understanding of the individual patient’s circumstances, e.g. reduced mobility, needs assistance with activities of daily living, rather than requiring an objective measurement of frailty, e.g. walking speed or grip strength. For patients with dementia, the severity of dementia corresponds to the severity of frailty, even if they appear to be more physically robust. Cognitive impairment, dementia and depression have also been shown to contribute to the reduction in physical activity which is characteristic of frailty, and are risk factors for falls in older people.17, 18 If cognitive impairment or dementia is suspected, a screening tool such as the six-item cognitive impairment test (6-CIT) or the Mini Assessment of Cognition (Mini-COG) may be used. Depression can be identified in older people using the 15 question Geriatric Depression Scale where a score of more than ten is indicative of depression. The impact of frailty upon the efficacy and safety of many medicines is not known. People with frailty are almost always excluded from clinical trials and consequently the optimal dose, therapeutic response and adverse outcomes associated with medicines are unknown in this group. Medicines should be used carefully in people with frailty to minimise potential harm, i.e. start at a low dose and increase slowly if required, with close monitoring for adverse reactions. Dose adjustment may be required for medicines that were initiated in patients at a younger age or when frailty was not present. For example, it may be appropriate to reduce the dose of antihypertensives or diabetes medicines to reduce the risk of falls and hypoglycaemia, respectively. 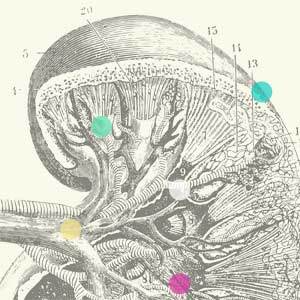 Age-related declines in receptor sensitivity, renal and hepatic function, as well as changes to body composition, i.e. increased fat mass to lean mass ratio, may mean that dose adjustments are necessary for older people with frailty.15, 19–21 For example, reduced renal clearance of medicines may increase the risk for an adverse reaction at a standard dose. This is particularly relevant for medicines with a narrow therapeutic window that are renally excreted, e.g. digoxin. Renal function is typically estimated by measuring serum creatinine and calculating the estimated glomerular filtration rate (eGFR).21 However, in people with low muscle mass, i.e. older people with frailty, serum creatinine levels may appear to be in the normal range, leading to an overestimation of eGFR.15 The Cockcroft-Gault equation, used to calculate creatinine clearance, is an alternative method for estimating renal function and is recommended for older adults as it accounts for bodyweight and is therefore more accurate than eGFR.15, 21 However, a conservative interpretation of renal function, and any dose adjustments based upon this estimate, is still recommended to minimise potential harm. For example, the Cockcroft-Gault method might overestimate renal function in people with frailty who are also obese as the equation uses total body weight, which will be higher in these people, despite having low muscle mass. Define the problem: older people with frailty may present with falls, incontinence or delirium. While the clinician or patient may attribute these events to normal ageing, often they are the result of an adverse reaction to a medicine. A medicine review should be carried out for older patients that present with any of these conditions. Specify the therapeutic objectives: the goal of treatment should be to improve quality of life through control of symptoms or prevention of disease. For patients with limited life expectancy, the vulnerability and increased susceptibility to adverse reactions are likely to outweigh the benefits of some medicines, e.g. aspirin, statins, bisphosphonates or proton pump inhibitors. Verify the suitability of the treatment: the benefit of the medicine must be considered in relation to any co-morbidities, potential medicine interactions and the therapeutic objectives. As frail older people are often excluded from clinical trials, the efficacy and safety of many medicines in this group is unknown. Initiate treatment: adjust the dose of the medicine to account for pharmacokinetic and pharmacodynamic changes in people with frailty, e.g. a lower dose may be required to achieve the therapeutic goal.15 Only initiate one medicine at a time so that any changes to the patient’s condition, including any adverse reactions, can be accurately documented and addressed. Give information, instructions and warnings: information should be provided to the patient and their caregivers; warnings should include monitoring for adverse reactions, particularly as these might manifest as reduced mobility, falls or confusion. Ensure a clear plan is also recorded in the patient’s medical notes. Monitor (and stop) the treatment: once the therapeutic target has been reached, the medicine can be stopped (if appropriate, i.e. not a chronic condition requiring ongoing treatment). Only one medicine should be stopped at a time. The dose should be reduced gradually if required and the patient monitored for any discontinuation-related adverse effects or recurrence of symptoms. There are currently no interventions known to reverse frailty, however, there are some strategies that can help slow its onset and progression in older people. The optimal frequency, duration and intensity for exercise interventions aimed at preventing or slowing the progression of frailty has not been determined, however, the recommended target for all older adults is 30 minutes of aerobic exercise per day, five days a week, plus an additional two or three sessions each per week of resistance training and balance/flexibility activities.24, 25 This target may not be suitable for all people and starting with low-intensity exercise one or two days a week and building up to five days a week may be a more appropriate goal. For older people who are underweight, increasing their daily calorie intake may help to slow or prevent the progression of frailty.24 If the patient cannot manage this through diet alone, a nutritionally complete food supplement (e.g. Ensure or Fortisip) may help them increase their daily calorie intake. Ensuring adequate dietary protein intake is important for helping prevent the age-related decline in muscle mass and strength which is closely associated with frailty.26 For older people who are obese or have increased abdominal adiposity, lifestyle interventions such as increasing exercise and making healthy food choices should be recommended. Thank you to Dr Chris Cameron, General Physician and Clinical Pharmacologist, Capital & Coast DHB for expert review of this article. Abellan van Kan G, Rolland Y, Bergman H, et al. The I.A.N.A Task Force on frailty assessment of older people in clinical practice. J Nutr Health Aging 2008;12:29–37. Barrett P, Twitchin S, Kletchko S, et al. The living environments of community-dwelling older people who become frail: another look at the living standards of older New Zealanders survey. Soc Policy J New Zeal 2006;28:133–57. Vieira ER, Palmer RC, Chaves PHM. Prevention of falls in older people living in the community. BMJ 2016;353:i1419. Accident Compensation Corporation (ACC). Love your independence. 2018. Available from: https://www.acc.co.nz/assets/injury-prevention/ACC7745-love-your-independence.pdf (Accessed Oct, 2018). Molga A, Couteur D, Hilmer S, et al. Australian and New Zealand Society for Geriatric Medicine: position statement - prescribing in older people. 2018. Available from: http://www.anzsgm.org/documents/PositionStatementNo29PrescribinginOlderPeople26March2018.pdf ( Accessed Oct, 2018). bpacnz. Causes and diagnosis of depression in elderly people. 2010. Available from: https://bpac.org.nz/BPJ/2010/March/falls.aspx (Accessed Nov, 2018). New Zealand Formulary. NZF v77. 2018. Available from: https://www.nzf.org.nz/nzf_2439 (Accessed Nov, 2018). de Vries TPGM, Henning RH, Hogerzeil HV, et al. Guide to good prescribing. A practical manual. 1994. Available from: http://apps.who.int/medicinedocs/pdf/whozip23e/whozip23e.pdf (Accessed Oct, 2018). Ministry of Health. Physical activity for older people (aged 65 years and older). 2018. Available from: https://www.health.govt.nz/your-health/healthy-living/food-activity-and-sleep/physical-activity/being-active-everyone-every-age/physical-activity-older-people-aged-65-years-and-older (Accessed Oct, 2018). Ministry of Health. Food and nutrition guidelines for healthy older people: a background paper. 2013.